If there is an afterlife or heaven and my dog is not there, I've no wish to go. - London magistrate during a court case. Had my boy 3 years from Celia and Jimmy. He was a sad boy then, he had a luxury life to the end. You were quickly taken from us by a stroke. RIP my Johnny Boy. This house is for the comfort of our dogs, visitors must take second place. If you love dogs you'll understand, if not, what are you doing here. - From a card hanging in our entrance hall. To our beautiful boy Tommy, you were with us for 12 great years, you were very much a Daddy's boy, you knew how to bribe us into giving you extra treats with those great big eyes and your little dance! It's just not the same coming home, you're not at the window waiting impatiently or following us about into every room - sideways!! It's difficult to get up in the morning without our furry alarm clock but Cups of tea are now safe to be left unattended. 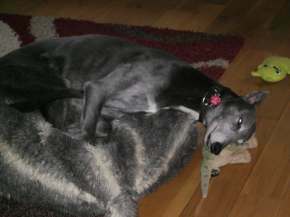 Rosie, died 2 May 2015. Heidi and Carree. 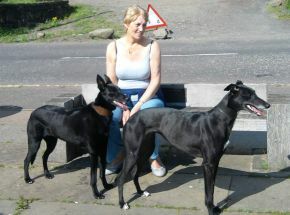 Rosie and Jip were picked up in February 2008 from Greyhound Rescue Fife in the old Kinghorn days. 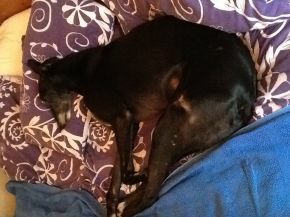 This morning Rosie collapsed while out for our walk and quickly passed away. She has been an absolute joy for these last seven years and will be sadly missed. -- Norman and Mary. In memory of our two sweet girls who hit it off immediately they met and shared everything. We are sure they will be enjoying one another’s company and friendship playing over the rainbow bridge. 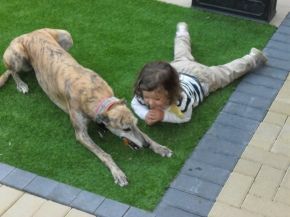 You are both missed so so much as your presence warmed our home with unconditional love. Heidi and Carree will live in our hearts forever. 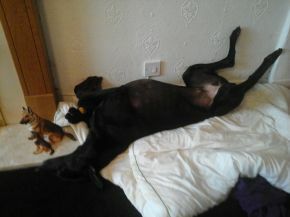 Livvie, greyhound and Sam labrador. 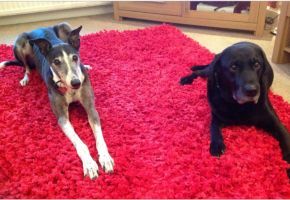 Livvie died in September last year and Sam on 7 June 2015. 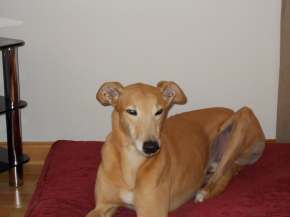 Livvie was adopted from GRF in March 2006, she was called Merrie then. Both are sadly missed by Annette and Alan. We adopted Benny 6 years ago from Celia and Jimmy. We decided to call him Bailey and he was the most wonderful dog ever. He passed away on July 4th 2015. We miss him so much. We lost our beautiful Missy, 16th November 2015 to the dreaded bone cancer. 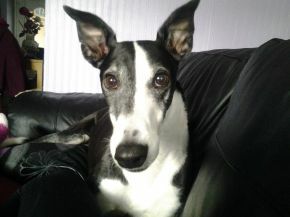 Adopted us in July 2012 with her pal Pancho from Greyhound Rescue Fife. Will be forever in our hearts, and memories will never fade. Love you sweet girl, run free over rainbow bridge till we meet again. --- Mummy and Pancho. Our beautiful boy Toby put to sleep 3rd September 2015. He gave us so much pleasure and made us laugh every single day. Have fun at Rainbow bridge baby. You left paws prints on our hearts. Miss you heaps. --- Love Mummy and Daddy. An example I tried to be. Dedicated to everyone who has ever lost a beloved pet.